Hello! Happy Monday. 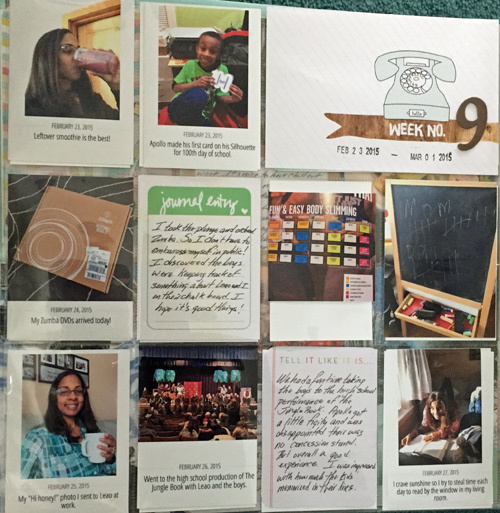 Here I am with another week of project life to share. 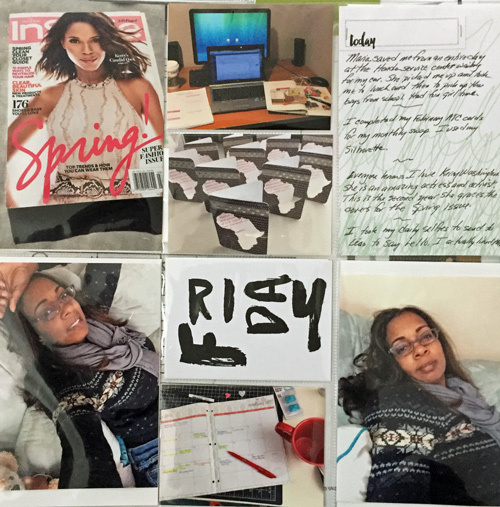 As I was writing this post, I realized that this is the first week that I featured mostly myself in the layout. So many times I think about how I am always the one taking the photos and that I won’t have enough record of me for my kids and future generations but I seem to have made up for this in week nine if nothing else!! First off, I love the graphic of the older telephone on the title card. I remember using a rotary dial telephone growing up.So it is fun for me to see the image. I remember feeling like we were the last family on the Cape where I grew up with a rotary phone. I thought my mother was doing it on purpose to make my life miserable (yup, I had my bratty moments as a kid too!). When I look at the two-page spread, I laugh and say, if you squint real hard you might that was me on the cover of InStyle magazine. NOT!! That is Ms. Kerry Washington and for those of you that don’t know her, she is a pretty amazing actress and activist that I have gained some inspiration from over the last few years. Not only is she an amazing actress, but she speaks her mind so eloquently and has immersed herself deeply into her activist endeavors. Just a great person all around. So when I saw an interview with her, I picked up the magazine. I included a photo of Apollo with his first big Silhouette project he made. I truly love that he is interested in my crafts and wants to participate. He has even joined my ATC swap group and loves making and receiving art from my friends. This week I also ordered a Zumba DVD set from non other than QVC. You know how those infomercials hook you! Actually, I had been researching some cardio DVDs including Zumba prior to the QVC offer. So it just helped me go ahead and take the leap. I have always incorporated fitness in my life. In college, I began weight lifting, after college I added Yoga and then Pilates. So recently I thought I would give Zumba a try. Now, I have taken spin classes and yoga classes with no inhibitions but Zumba…nope. I am too shy to partake in a class with real people. So the next option was to research DVDs so I could avoid humiliation. I have to say, weeks later, that I am enjoying it. This set came with so many DVD workout options and even a step for a Zumba step class. It’s a lot of fun, I sweat a lot and I am slowly learning all the movies. Ultimately it’s a fun way to incorporate cardio without having to go running (something, I am not interested in doing). It even comes with a schedule so all I have to do is show up in my living room and dance. The photo of the chalkboard on the far right is in the boys’ playroom. I noticed it one day when I was coming down the stairs so I took a picture and sent it to Leao at work to ask him what this tally system represented. He didn’t know. I only hope that it is something good, since I have more tally marks! My “Hi, honey” photos. Well, throughout the week, I like to send what I call my Hi honey selfies to Leao to remind him I am thinking of him. The picture of me holding the tea cup and the two on the second page are my Hi honey photos. It’s what I do. Don’t judge. As winter was winding down, I found myself drawn to any window in our house that let in rays of sunlight. Fortunately, in the afternoon, I can lay on my couch and close my eyes and pretend I am sitting outside somewhere warm. So I naturally grabbed my book and soaked up the rays. Apollo joined me and Nicholas took the photo. I also included a photo from our night out with the boys to go see the High School drama club perform The Jungle Book. It was great. They liked it. Apollo asked his usual questions which are, “Is there an intermission so we can go to the concession stand?”. Is he a mini-me or what? Definitely going to look for more opportunities like that for them. I included a photo of the complementary workstation I sat at the Honda gallery while waiting for my car to get serviced. It was actually nice and I used my laptop with their free WIFI and got some work done. But then it turned into a longer stay so I sent a text to my friend Maria. She is so sweet. She came and picked me up, took us to lunch where we laughed and ate some yummies and then when my car still wasn’t ready, she drove me to pick up to get the boys and then back to finally pick up my car. It was one of those unscheduled girlfriend moments that was so great. The time went by fast because we had time to catch up and laugh at silly things. Like me complaining about how big the portions are that the restaurant served and yet, there was nothing left on my plate at the end of our meal! So funny. I also included a photo of my ATC cards I made for February. I chose Black History for my theme and made them on my Silhouette. A great week overall. I will be back next week with week 10. Wow we are moving into the two digits! !